Derek Hough sent his dad a text a few weeks back. Bruce Hough opened Derek’s Instagram page, where the Dancing With the Stars and World of Dance star shares photos with nearly 2 million followers. In the caption, Derek listed the 12 points of the Scout Law and what each meant. The first: So that’s where Derek’s Cub Scout shirt went. Scouting did some great things for Derek, too. He was in Scouting until age 12, when he moved with his sister Julianne to London to pursue a dancing career full time. Bruce, talking to me by phone last week, says that was long enough for the program’s transformative power to take hold. One of Bruce’s favorite Scouting memories happened at Camp Steiner, the Utah camp that is the highest-elevated Boy Scout camp in the country (10,400 feet). Derek was at summer camp for the week, and Bruce came to visit. Bruce was going through a divorce at the time, and Derek was feeling a little down. So the two paddled their canoe into the middle of the lake. They stowed their paddles, looked up at the stars and just talked about life. “We had one of those great, life-lasting moments,” Bruce says. Derek earned five merit badges that week, but he was most proud of his Astronomy merit badge. That merit badge ignited an enduring love of astronomy. These days, when Derek isn’t dancing with stars like Marilu Henner or Nastia Liukin, he’s gazing at stars like Sirius and Rigel. Twenty years after that life-changing day at Camp Steiner, Derek and Bruce Hough still enjoy heading outside together. So they hit the road to see three national parks in three days: Grand Teton, Yellowstone and Glacier. As they drove, they sang rock ’n’ roll songs. They stopped at Teton High Adventure Base, operated by the Great Salt Lake Council — where Bruce is council president. They went whitewater rafting, tested out Derek’s drone and posed for a photo with Camp Director Thad Bookman (above, in the middle wearing green) and some members of the camp staff. Derek is one of the biggest names on Dancing With the Stars and will headline this December’s Hairspray Live! on NBC. His sister Julianne is a judge on Dancing With the Stars and played Sandy in Grease: Live earlier this year on Fox. That much time in the spotlight means people are always “telling you how great you are,” Bruce says. But Derek and Julianne stay grounded. “I’m Derek and Julianne’s dad,” Bruce said. Immediately the bouncer’s face softened. Derek and Julianne have a reputation for being courteous to everyone on the crew. “They say, ‘They treat us very well. Get to know us and our family. They’re just kind to us,'” Bruce says. “For all the accolades they receive for their talents and their skills, the best reward as a father is that they live the Scout Law of being kind to others,” he says. When I talked to Bruce Hough, he mainly wanted to discuss his outstanding kids. That’s what you’d expect from a justifiably proud father. But this story isn’t complete without telling you about Bruce’s many contributions to Scouting. Bruce received the Eagle Scout award in 1970 in the Inland Northwest Council of Idaho. He was extremely active in Scouting as a youth. After attending Camp Easton on Idaho’s Lake Coeur d’Alene at age 12, he decided to return on camp staff for each of the next six summers. When he was just 14, Bruce started an Explorer post. He was later the Area 2 representative on the the Explorer Presidents’ Association. In 1972, he became Wood Badge trained and was the youngest participant on the course. He also took junior leader training courses at Philmont and conducted youth training for his council. As an adult, Bruce attended Ricks College in Rexburg, Idaho (now called BYU–Idaho). The council that served Rexburg was building a new camp and looking for volunteers. Bruce was in. “We literally built the camp from scratch,” he says. Island Park Scout Camp was born. Bruce moved to Utah, where his adult Scouting contributions have accelerated. He developed an Exploring-oriented Wood Badge course and served on several Wood Badge staffs. 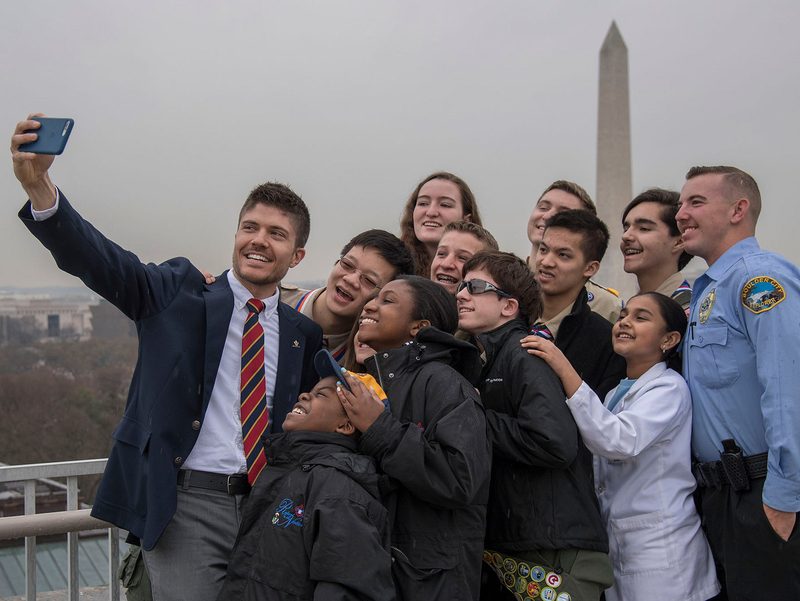 He has a passion for using Scouting to elevate people out of tough situations, which is why he helped start a program to bring refugees into Scouting. The Great Salt Lake Council now has 50 countries — and 100 different languages — represented in refugee units.